For years Jean-François Dubreuil has been analyzing the world’s daily newspapers. Like Jean d’Imbleval, he starts from an existing structure, in this case the layout of newspapers. 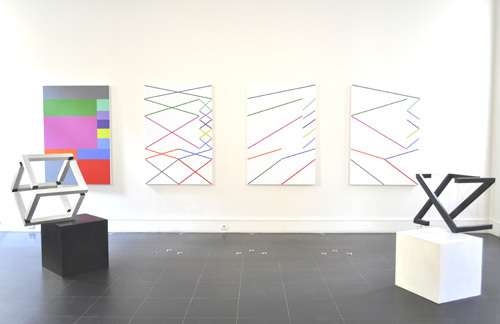 The construction of his paintings thus involves no chance factor, unlike his choice of colors, which are picked at random except for two constants : photos are represented by black and ads by red. In his early works Dubreuil completely filled the zones of newspaper articles with color, but later simply outlined them, leaving the interior space blank. 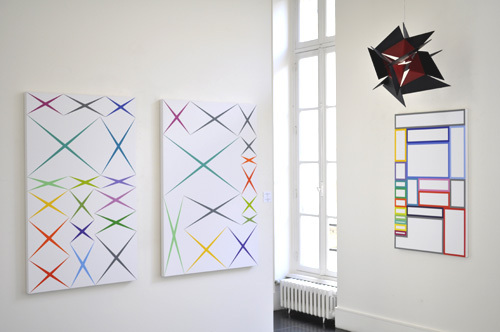 In his most recent work the structure of the newspaper becomes increasingly invisible as colored crosses replace the blank spaces, underscoring a few lines that generate a lighter, more graphic perception of the painting. The eye must henceforth work to reconstruct the invisible. According to Jean d’Imbleval—alias Jean-Claude Lahumière, who passed away in 2014—the cube was the first form to emerge from pure human reasoning. In itself it thereby symbolizes art construit. 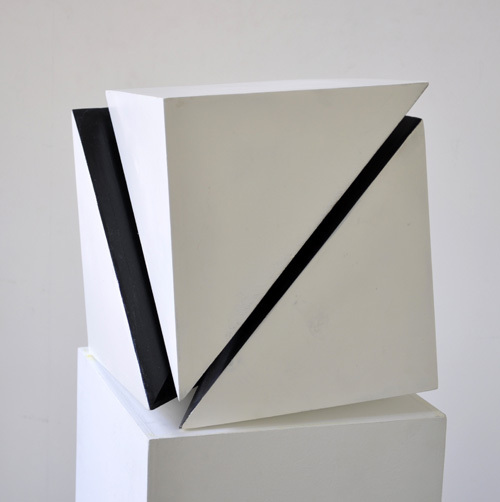 Mathematicians and other intellectuals have sometimes tried to find sophisticated computations in d’Imbleval’s works, and yet he devised his sculptures empirically, starting with the cube that inspired so many of his explorations for so many years. His self-bracing structures render visible the magic of balance, just as the construction of a solid cube can reveal the secret of triangles that appear or disappear in the eye of the beholder as they poise there, in equilibrium, displaying the incredible magic of weightlessness before our startled eyes.